On Thursday, we passed along the news that Sprint had sold every last one of the Samsung GALAXY Nexus phones that it had set aside for pre-orders. Priced at $199.99 with a signed 2-year contract, the phone was priced to sell. The official launch date for the phone is April 22nd or this coming Sunday. You can imagine how surprised (but deliriously happy) some were to find the box with their new handset in it sitting right outside the front door on Friday. Did your Sprint Samsung GALAXY Nexus arrive on Friday? Truthfully, though, there was a good reason to have expected to receive the handset on Friday. Sprint had said in announcing the pre-orders that as long as supplies lasted, some of those who pre-ordered the phone would get it on Friday, April 20th. Still, for many out there who never seem to catch a break, it must have been refreshing to be able to stare at that 4.65 inch Super AMOLED screen all day Friday. The Samsung GALAXY Nexus is Sprint's first LTE enabled phone. Don't forget that the Sprint Samsung GALAXY Nexus carries support for Google Wallet and if you activate it within a week of activating your phone, you will find your virtual wallet stuffed with virtual cash. $10 is supposed to be credited to you instantly, right after you sign up for Google Wallet. Sometime between April 22nd and May 22nd, Google will stuff an additional $40 of virtual cash in your virtual wallet. It's enough to make you virtually wealthy! 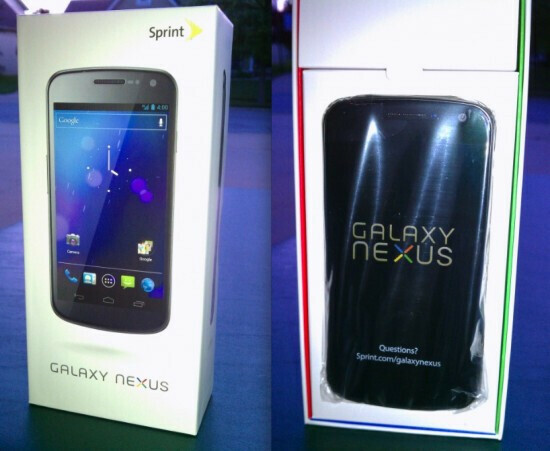 If you were one of the lucky ones who received their Sprint Samsung GALAXY Nexus on Friday, let us know by dropping a comment in the box below. Yet another troll post huh? Spydroid huh? There are disclaimers that you can accept if you want it to know your location, nothing is set in stone, you can enable it and disable it whenever you please, on other platforms you can accept it but cannot remove it afterwards right? You can on other platform like IOS, fandroid. I'm having a great time with my Galaxy Nexus. They'll be lucky enough if they could get service. This will b a hit for sprint as their LTE footprint grows. You hate people having choices. That's what that is. What software version is it running? 4.0.2 or higher? If that's true what is the excuse for VZW Galaxy Nexus still officially running only 4.0.2? I thought the biggest thing about ICS was fast updates? I seriously hope the Galaxy Note comes out for Verizon. With that big boy, I won't care what version it's running. I got some hands on time with the galaxy note on at&t - im pretty sure it was running gingerbread. I wasn't overly impressed as it just seemed like a stretched out clone of my epic 4g touch (at the time). but maybe after some time with the g nex, it will be appealing, idk! Sams Club has them on 4/22 for 148.88 for new or upgrade customers, plus the 50.00 for signing up for that Google pay with your phone deal. Update: Sam's Club or Best Buy in Phoenix hasn't got their shipments yet. Went to Sprint and got it for 149.99, they said I had a 50.00 discount waiting. Finally Sprint showed me some love for my 10+ years of service, hopefully we get LTE in a decent time frame.